We went out Sunday as a family in search of Santa Claus, lunch and a holiday picture. I know. It sounds mighty ambitious. After we pried Rowan away from the back door of Santa’s trailer–I mean, house–we assured him we would go around to the front, so he could see Santa Claus. Then we saw the line. Holy moly! It was wrapped all the way around the front of the movie theater. So we wandered through the Farmers Market, debated buying a dozen eggs, ate lunch, debated buying a dozen eggs again (Farmers Market eggs kind of freak me out a bit. I’m always scared I’m going to find a baby chick.) 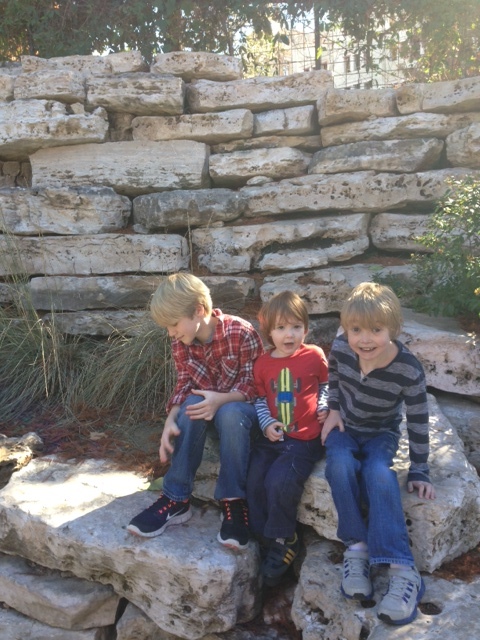 and finally decided to go to The Pearl to see if we could get a good picture of the boys for our annual holiday card. Plus, we were going to see if we could find a Santa Claus at The Pearl that didn’t have such a long line. Last year, while at The Pearl, we ran into a Mexican Santa wandering around, complete with a sarape and sombrero, who let us take a picture of him with our boys and it worked out perfectly. He even asked them what they wanted for Christmas. To tell you how far Kevin and I will go not to stand in line to see Santa, we’ve had parties at our house before and called it “Cookies and Cocoa with Santa” and had a guy dress up as Santa Claus. We just asked every kid we invited to bring one toy that was donated to the children’s hospital. It was freaking brilliant. And we’ll have to do it again now that Rowan is old enough to know what’s going on. But this year, we didn’t see anybody who even remotely looked like Santa Claus. Not even a guy with a beard that we could pass off as an undercover Santa, which was a huge disappointment for Kevin and me because that means we’re probably going to have to schlep poor Rowan down to The Quarry again and wait in THE LINE. We stopped in at The Twig Bookstore to let the boys pick out a couple of new books and walked down to the river to find a good place for some pictures. I should say Liam limped, hopped and moaned his way down to the river. He started complaining about his ankle popping. I try to stay in touch with the fact that my perspective on things is a little skewed when it involves complaints of pain or illness. If it’s not life-threatening, what’s the big deal? I know this about myself. So I took a deep breath and patiently asked Liam eleventy-billion questions about his ankle. Did you fall on it? Did you twist it? Does it hurt when you bear weight on it? Does it hurt when you don’t put any weight on it? None of the above. It was just popping, which I’m sure is really annoying, but not possibly as annoying as he was moaning, groaning and whining about how unbelievably miserable he was. When we finally made it down to the river, we had to wait a good five minutes for him just to make it down the steps. Then he refused to smile for any of the pictures. When I started to wonder whether it would be considered child abuse if I pushed him into the swirling, chilly, brackish waters of the San Antonio River, I decided it was time to go home. So for all of you who look forward to getting a picture in the mail of my three smiling angelic boys, I am so sorry. It’s not happening this year. This is the best I could do. Please notice Liam’s scowl as he’s looking down at his “hurt” ankle. After returning home, y’all will be thrilled to know that Liam made a miraculous recovery in the short span of about thirty minutes. Who knew all his ankle needed was to be propped up on a pillow while he played a video game? “Are you sure?” he asked, giving me a sideways look. LOL.Beautiful children. Happy Holidays to the Collins’. Kids! Never a dull moment! One year my two little grandsons got a kick out of having their pix made with Cowboy Santa in Gruene. Spoken like a true court reporter! Love the adorable picture! Merry Christmas to you and your family, Heather! Hahahahahaha and I love the picture! Pretty Heart breaking that Santa started walking faster ignoring Rowie’s efforts to get his attention. What a disappointment!!!! « Where’s the red, hot, swollen knee?